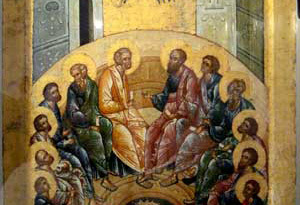 Orthodox Pentecost or also referred to as Whit Monday and Whit Sunday celebrates the Holy Spirits descent onto the disciples. The eastern church uses the Julian calendar for many of its holidays and this is why holidays are different from the Western Church nations that use the Gregorian calendar for church holidays. People can attend a special church service. Some can watch a traditional Calusarils dance to give protection against mythical creatures. This day is a national holiday with most government and business offices closed. The eastern Christian Church bases many of its holidays off the Julian calendar which puts Pentecost in the eastern church different from the western church using the Gregorian calendar.